I sat down yesterday and figured this pattern out. I will do my best to share the pattern. I have shown pictures of one with 2 strands accross and one with 3. Just modify however you like it best. First: Chain 80 stitches (st). turn, keeping work right side up at all times. slip stitch (sl st) in next 20 stitches, chain 40.
thus creating a third row. If you only wanted 2 rows you would tie off now. chain 40, sl st in last 20 stitches. tie off. cut a 2 inch length of yarn and weave it back into work to finish both ends. 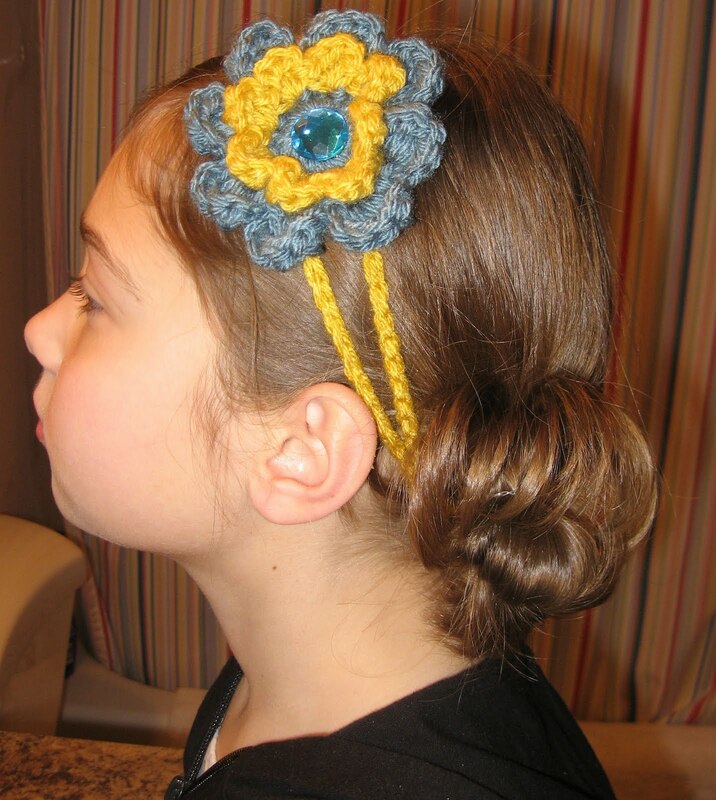 with needle and thread, sew on button to one end of head band. p.s. I use E600 glue to adhere the jewel's in the center. jewels were purchased at Hobby Lobby. Pattern for flower can be found here. This pattern was Irish Rose. You are so quick and crafty, Jenny! Cute!! Hope the Andersons are having a fun-filled holiday season. We miss you guys. Please teach me how to do the flowers! I have tried and tried to figure it out, but I haven't crochet(sp?) enough.....maybe over Christmas break?!? P.s. Sadie looks so cute! Your daughter is so lucky to have you for a Mom......If it couldn't be hot glued it wasn't made at my house!!!!!!!! Love the headband!